The Disk Module allows for adding DASD to a Gearbox. 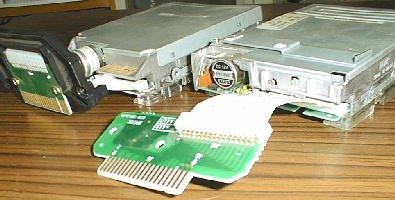 The Disk Module consists of a double-wide shroud and a Disk/Diskette Adapter Card, to be plugged into the frame in place of two empty card shrouds. 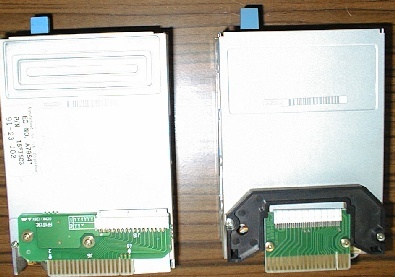 The Disk/Diskette Adapter Card contains 0.5MB of DASD Cache Memory, and supports up to two 1.6" high 3.5" drives and a 1.44MB Diskette Drive installed inside the shroud. The DASD Module has a C60 SCSI port on the bottom. The upgrade SCSI BIOS chips for the SCSI and SCSI w/cache (92F2244/92F2245) work in this board, and probably all others. If you look at the SCSI w/cache, single oscillator, the parts are the same. NOTE: PS/2 adapters should not be installed in the slot #9 position. This is due to limitations with setup and diagnostic code recognizing such adapters in that position. Your C: MUST be set to ID6, a second HD MUST be set to ID5, as the setup lacks selectable start sequence. The SCSI adapter itself is ID7. Something I haven't seen- if you add an auxiliary DASD module to slots 1 and 2, the drives must use ID0 to ID4. The drives within the Auxiliary DASD module are considered as external SCSI devices. Folks, this is to help you keep your DASD module relatively unscarred. Pull up on one of the ears and twist the latches out. (Important to remove them!). Now go to the back of the module and undo the two catches. Can't miss them. The DASD module is the only one to have them. Pull the cover out. It will pivot on the two tabs at the front edge. NOTE If you left the latches on, this will NOT work. Once you open the DASD up, the top swings back, held at the bottom by the data and power cables. The 7568 requires the squarish 0661/0662/0663/0664 drives to fit the 7568 specific drive rails. The mounting holes on the 1" high 0662 do NOT match. You can drill a new pair of screw holes in the rails, but keep this in mind- the on-board SCSI is 50 pin, so why not keep with the 0662/3/4 1GB-2GB range? The drive in the 7568 is used in the Model 70, PN 15F7503. It is a modified ALPS DFP723D12F with a PCB screwed in place on the top. The drive that came with an 8570 has a clear plastic sled screwed on, but the same PN 15F7503. Another 8570 drive is a Mitsubishi MF355C-599MB. Remove the clear plastic spacers between the drive latches. Unscrew the two screws on the outside of the shroud (they screw into the FD's bottom!). Spread the two sets of latches one side at a time, pulling up on the FD. Once the FD rails are past the latch, pull it back and up. The floppy rails are held on with two screws per side. The funky thick black bezel will come off quite easily AFTER you unscrew the front rail screw. Trust me. Do NOT try to pry the thick bezel off, it is rather ready to fall off once the front screws are half way out. His Making a diskette drive adaptor provided me with the extremely important pinout information that inspired the following Super High Intensity Tinkering (S.H.I.T.). The D40 BIOS (maybe C40 as well) supports the 2.88MB floppy (with it's dust shutter!). But the 2.88MB has a different location for it's 34 pin header and it's slightly offset, so the floppy cable HAS to be longer. Martin Adams is sending me a 40-34 pin cable as we speak. His picture of it looks a bit different from what I've tried. Now use a 10" length of 34 conductor cable. Crimp on the 34 pin header, Watch the orientation of the floppy header- on my FD, the key points down. Thankfully, pin 1 on the floppy and pin 1 on the DASD board are both to the left as you look at the opened module (with the floppy shutter pointing towards you). Now measure out 8". You should have about 2" past the 40 pin header. Now bring out 3 and 6, cut the rest of the conductors flush at the 40 pin. Now bring them around the back, over 38 and 40 and exit the connector towards the 34 pin header. Crimp. A little ticklish getting 3 and 6 onto the slots of 38 and 40, but it's sooo much neater. Selects a 32kb memory block which this adapter will use for it's BIOS ROM. There are five memory ranges. <"Segment C000" >(mem c0000-c7fff), "Segment C400" (mem c4000-cbfff), "Segment C800" (mem c8000-cffff), "Segment CC00", mem cc000-d3fff), "Segment D000" (mem d0000-d7fff), "Segment D400" (mem d4000-dbfff), "Segment D800" (mem d8000-dffff), "ROM Disabled"
Select the arbitration level that SCSI will use to transfer data. This controls whether the adapter will release control of the bus when it has been using it exclusively. <"Enable Wait State">, "No Wait State"
Change the SCSI ID of the adapter. <"7">, "6", "5", "4", "3", "2", "1", "0"
< "No Boundary">, "32-Byte Boundary", "64-Byte Boundary", "128-Byte Boundary"
DMA channel the diskette adapter will use to transfer data. Controls whether the diskette adapter will release control of the bus when it has been using it exclusively. Primary or secondary address range of the diskette portion.